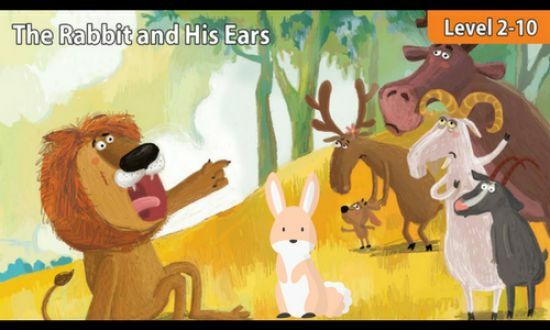 This is one of the best fables with morals and animals. Once upon a time in a jungle, there lived a big and strong lion. He used to scare little animals and hunt them for his lunch and dinner. All the tiny, little animals were frightened of him. But they could not do anything. One day, the lion was eating a goat for his dinner. Suddenly, the lion got badly hurt by one of the horns of the goat. “Ouch!” roared the lion. “This goat has horns. I don’t like horns.” He became very angry at the goat’s horns and so he decided to show the door to the animals with horns. “No more horns!” roared the lion. “All animals with horns must leave my jungle,” he said. Also, read The Dog And The Rabbit. “Where will we go?” cried Grandpa goat. “I don’t care! Go, this is your last day in this jungle,” said the lion. The lion’s orders struck terror among the poor animals. Those animals who were unfortunate to have horns started packing their belongings and were soon ready to leave the jungle the very next day. The rabbit was so afraid of the entire situation that he could not sleep for the whole night. Whenever he closed his eyes to sleep, the face of the fearful lion would come in his thoughts. When the rabbit had finally slept, he had awful dreams about that terrible lion. It was a long night for the poor rabbit as well. The next day, all the animals with horns went away from that jungle. All the other animals came to see off them. As rabbit was going back to his burrow, he saw his own shadow in the early morning sunshine. He saw his long and pointed ears, a terrible fright seized him. You may also like to read, Rabbit And Wolf. MORAL OF THE STORY: DO NOT GIVE YOUR ENEMIES THE SLIGHTEST REASON TO ATTACK YOUR REPUTATION. YOUR ENEMIES MIGHT TAKE A HOLD OF ANY EXCUSE TO ATTACK YOU.